Right after going to Nashville I took off for a cross country trip to celebrate the interstate highway system’s 50 year anniversary. I’m in a convoy and we’re making daily treks with multiple stops and press conferences. It’s made it difficult to make it to a daily Mass. However, I have made it to Mass a few times. 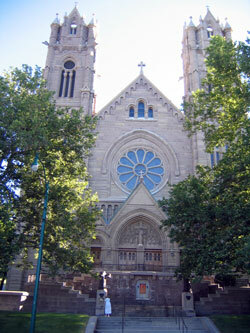 Here’s the Cathedral of the Madeleine in Salt Lake City, UT. It’s a very traditional design and a historic landmark.